The EK-Annihilator EX/EP Square is a dedicated server grade water block with 1U chassis compatibility which was specifically developed for LGA 3647 (Socket P) Intel® processors. 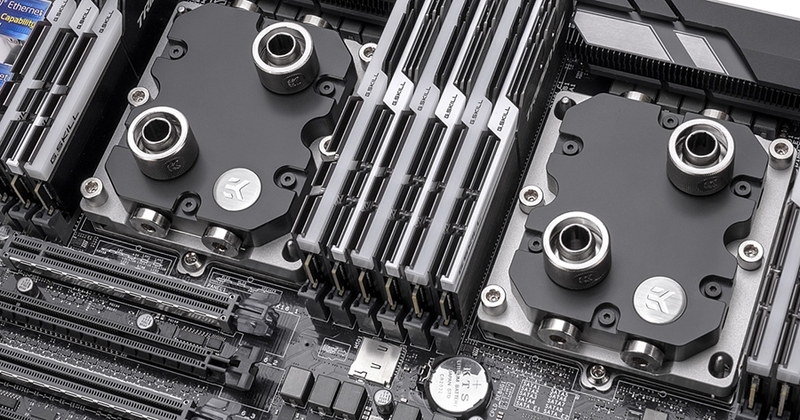 The entire CPU block was designed from the ground up to fit the requirements of the Square ILM socket and to integrate multiple connectivity options for server rack requirements. With that said, the new server-grade CPU block is 1U chassis type compatible for use server and workstation type motherboards. The EK-Annihilator EX/EP Square water block features a total of 6 ports, which allow for versatile connectivity options. Two top ports are standard G1/4" threaded, while the side ports are G1/8" threaded. This enterprise solution is built for performance, reliability, serviceability and no compromises in mind. The EK-Annihilator EX/EP Square water block meets these demands with low hydraulic restriction and top thermal performance making it the perfect choice for liquid cooling high-density computing systems. EK-Annihilator EX/EP Square water block features a precisely machined copper base (sometimes referred to as ‘cold plate’) which is made from purest copper available on the market and is treated with nickel electroplating. The top is made from CNC machined from durable black POM Acetal and the CPU hold-down bracket is CNC machined from a thick piece of aluminum. The CPU block is equipped with Square ILM mounting hold down. This product may be used with any 6mm ID tubing, although we highly recommend the use of 6/9mm EPDM industry grade tubing. 1U chassis compatibility is guaranteed only with side G1/8" ports being used. The CPU block is equipped only with Square ILM mounting hold down.